Matches of Magic are won and lost by your ability to read your opponent’s soul, figure out what it is planning and what cards it has, then plan and execute a beautiful, multi-turn strategy that completely annihilates that stupid soul once and for all. Credit for all of the below finesses goes to the numerous people who have beaten me with them, and the people who beat them with them, and the people who beat them, and so on and so forth until probably the only people I actually have to thank are Jon Finkel and God. Prey Upon is vulnerable to getting blown out by a counter-trick. Somberwald Stag is not. Let’s see why. 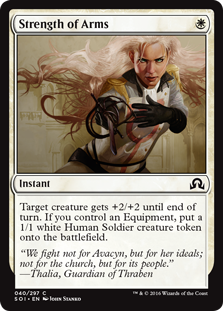 You cast Prey Upon, targeting your 3/3 Inspiring Captain and your opponent’s 2/3 Bygone Bishop. You hope that this will kill their Bishop and leave your Captain alive. Your opponent casts Strength of Arms, giving their Bishop +2/+2 and making it a 4/5. Now your Prey Upon resolves, and the 4/5 Priest kills your 3/3 Captain and survives. Your have 2-for-1ed yourself and are probably screwed. Now consider the Stag. You cast a 4/3 Somberwald Stag. 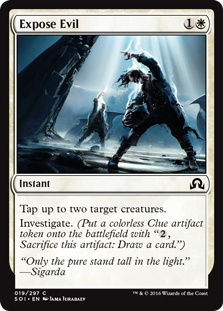 It enters the battlefield, and you target your opponent’s 2/3 Bygone Bishop with its trigger. Your opponent again casts Strength of Arms, and their Bishop again becomes a 4/5. However, the Stag’s ability reads “you may have it fight”, and whilst you choose the target when the ability goes on the stack, you only decide whether the fight actually happens when the ability resolves. You can therefore simply chose to not actually fight the Bishop. The Bishop survives, but so does your Stag. 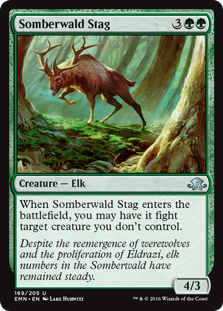 If the Stag’s ability was worded something like “When Somberwald Stag enters the battlefield, you may choose target creature. Somberwald Stag fights that creature,” then you would not be able to jack out after the Strength of Arms is cast. SUMMARY: pay close attention to how abilities involving “you may” are worded, and understand exactly when you are allowed to make the decision. You have a 6/6 Kessig Direswine and a 3/3 Inspiring Captain that has been enchanted with Bound by Moonsilver. 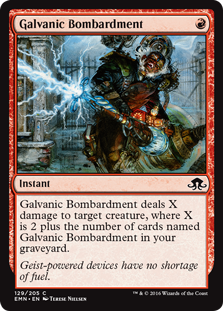 You have a Galvanic Bombardment in your hand. Your opponent has no creatures and 1 card in their hand. It is during their first main phase. 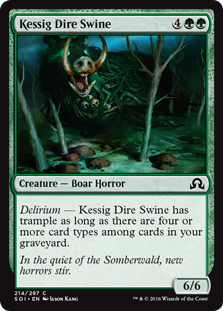 They want to be able to cast a crappy creature, then sacrifice it to move the Bound by Moonsilver from your Captain to your Direswine. You want to force them to sacrifice a land if they want to move it. 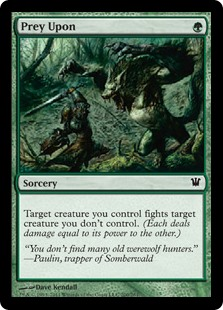 If they cast a creature without an enter the battlefield trigger, then you can’t stop them from sacrificing it to move the Bound by Moonsilver. Once the creature resolves, the stack will be empty and your opponent will have priority. They can then sacrifice the creature as planned. However, if they cast, for example, a Topplegeist, then when it resolves its enter the battlefield ability will trigger. Your opponent will still have priority, but this time the stack will not be empty and they will not be able to use Bound by Moonsilver, since it is not a time at which they can cast a sorcery. 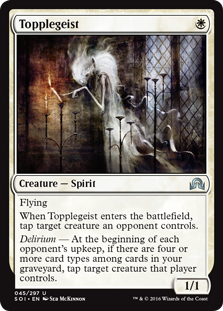 If they pass priority then you can cast Galvanic Bombardment on the now-resolved Topplegeist, killing it before your opponent has a chance to sacrifice it. 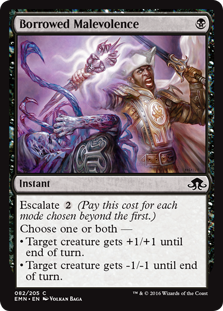 SUMMARY: when a creature with an enter the battlefield trigger resolves, the non-active player will have a chance to respond to the trigger before the active player has a chance to play creatures or sorceries. When a creature without an ETB trigger resolves, the active player can immediately play other creatures and sorceries. 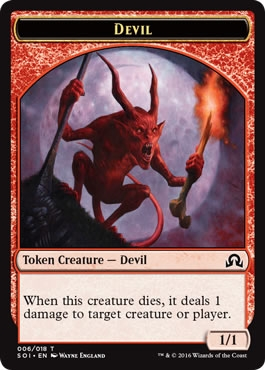 You have a 6/6 Kessig Direwsine, and your opponent has 3 1/1 devil tokens that each deal 1 damage to a creature or player when they die. You attack with your Direswine. Your opponent triple-blocks with all 3 devils. Their plan is for all 3 devils to die, then for each devil to deal 1 damage to your Direswine as it dies. This will be exactly enough to kill it, which would be a shame for you. However, you are not actually obliged to kill all of the devils. When your opponent triple-blocks, you “order” the blockers. This is the order in which you will deal damage to the blockers. During the damage step you will first assign damage to devil #1. Once you have assigned this blocker enough damage to kill it, you may start to assign damage to devil #2. Once you have assigned devil #2 enough damage to kill it as well, you may start to assign damage to devil #3. Once again, the key word here is “may”. Usually you will assign blockers the minimum amount of damage required to kill them so that you can kill the other blockers as well. However, in this scenario you can instead choose to assign 3 damage to devil #1, 3 damage to devil #2, and then 0 damage to devil #3. Devils #1 and #2 will die, but devil #3 will live. The devils can therefore only deal a total of 5 damage to your Direswine, and it will survive. You have a Blood Mist and a Bloodmad Vampire. Your opponent has nothing. You move to combat, using Blood Mist to give your Vampire double-strike, and attack with your Vampire. 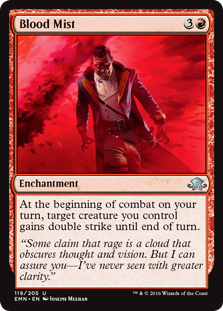 During the first-strike damage step, your 4/1 Vampire will deal 4 first-strike damage to your opponent, triggering its ability and giving it a +1/+1 counter. It is now a 5/2. During the normal damage step it will deal 5 damage to your opponent, triggering its ability again and giving it another +1/+1 counter. 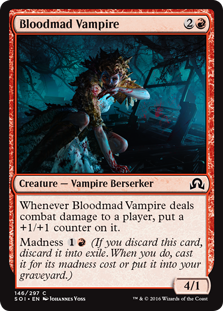 You end combat with a 6/3 Bloodmad Vampire that has dealt 9 damage. If you weren’t paying attention you might have only called the trigger once, instead ending combat with a 5/2 Vampire that has only dealt 8 damage. 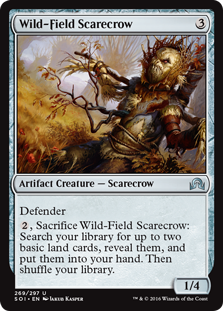 You have a Wildfield Scarecrow that you intend to sacrifice at the end of your opponent’s turn. Your opponent has a Faithbearer Paladin. They attack with their Paladin, and you block. 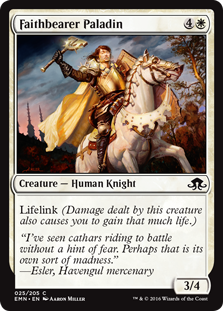 You sacrifice the Scarecrow before damage is dealt, and during the damage step the lifelink-ing Paladin finds that there is no longer anything there for it to deal damage to. Because the Paladin deals 0 damage, your opponent gains 0 life. You have a first-striking Thalia, Heretic Cathar. 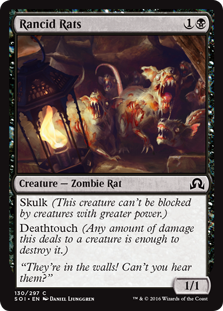 They have a deathtouch-ing Rancid Rats. You don’t need to worry about their Rats killing your Thalia if you attack. 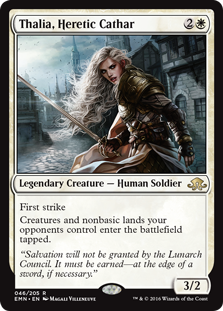 She will deal her first strike damage, the Rats will die, and they won’t be around to use their deathtouch during normal damage. Thalia will live. Often there will be no spells cast in any of these steps, and combat will be a simple battle of power and toughness. But you should be sure to move through each step methodically, and to not speed ahead to the next step and reveal your plans prematurely. Make sure you are being clear when you intend to proceed, giving your opponent enough time to stop you if they have some tricks. The same applies to every other transition. Don’t just unilaterally declare blockers; say “blocks?” and wait for confirmation that this is OK. Or “I’ll block…” and wait a second or two to give your opponent a chance to stop you. When you are the defending player, you get to wait and see what tricks the attacking player has during each phase before having to decide whether you want to play any tricks of your own. This can be a powerful weapon if you use it correctly. Many interactions are lost by the person who blinks first. 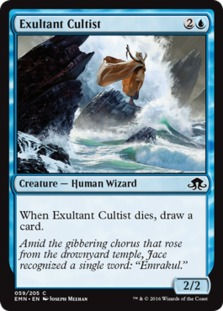 Your opponent is attacking with an Exultant Cultist. They have 1 card in hand. 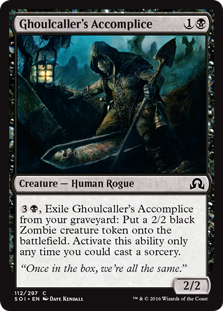 You have an untapped Ghoulcaller’s Accomplice and a Borrowed Malevolence with 1 Swamp untapped. You would be fine with trading off, but if possible you would like to use your Borrowed Malevolence to save your Accomplice. Them: “I’ll play Strength of Arms to give it +2/+2. Sometimes they will have been holding back a trick and will blow you out anyway, but you still gave yourself the best chance of success. SUMMARY: As the defending player, make sure you find out whether your opponent wants to play any spells before playing any of your own. This is particularly important when you have a removal spell that will kill an attacker before you get to the damage step. It might seem like it doesn’t matter when you play your spell, since their creature is going to die whatever happens. But this can be an excellent opportunity to extract some additional value. 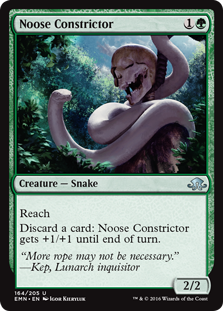 Your opponent is attacking with a Noose Constrictor and has 2 cards in their hand. You have an untapped Ghoulcaller’s Accomplice and a Murder in your hand. Be careful though. 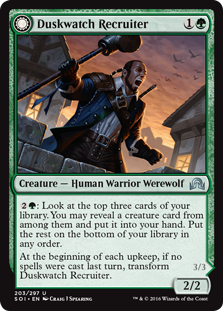 In the above example, if your opponent had had a Woodcutter’s Grit that they could have use to respond to your Murder, you would have wasted your Murder AND your Ghoulcaller’s Accomplice would have died. This would be unfortunate for sure, but not a disaster. On the other hand, if you had been gambling with something more valuable, like a Duskwatch Recruiter, this would be nothing less than a tragedy. A “rules lawyer” is someone who knows all the letters of the law but doesn’t care about the spirit. They seize on honest mistakes, spin legal traps and quietly shove you into them when all you wanted to do was somehow get a card from your hand onto the battlefield. However, there is a world of difference between rules lawyering and simply knowing your rights. None of these tips involve messing with your opponent; you’re just exploring and using the full depth of the game in the ways that its creators intended. I for one am looking forward to the next time I get annihilated by something I didn’t even know was possible. If you enjoyed this post, then I guarantee you will also enjoy “Another 10 somewhat advanced Magic: The Gathering plays”. And if you have any advanced plays of your own that I’ve missed, let me know!